If you’re all about living green, ditching your car for your bike seems like a good idea…until your cupboards are bare. That’s when this silly DIY project by Ryan McFarland doesn’t seem so ridiculous. 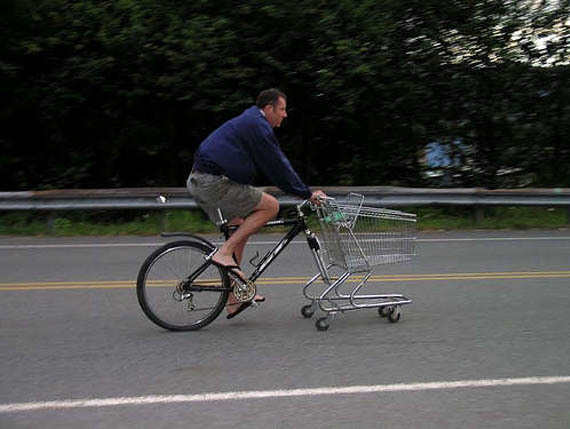 For going green while going grocery shopping, combining a shopping cart with a bicycle makes perfect sense. It allows you to ride to the store and carry your goods home with ample cargo capacity. Of course, I doubt it handles very well, especially once you load in a week’s worth of groceries. But it’s quite the head turner, nonetheless. Here's A Seven Person Tricycle, Because Why The Hell Not? BiWa Is An Exercise Bike And Washing Machine In One!